Gavin DeGraw Talks NYC Assault: "I Got Dinged Up & I Lived Through It"
Singer-songwriter Gavin DeGraw is speaking out about his assault. 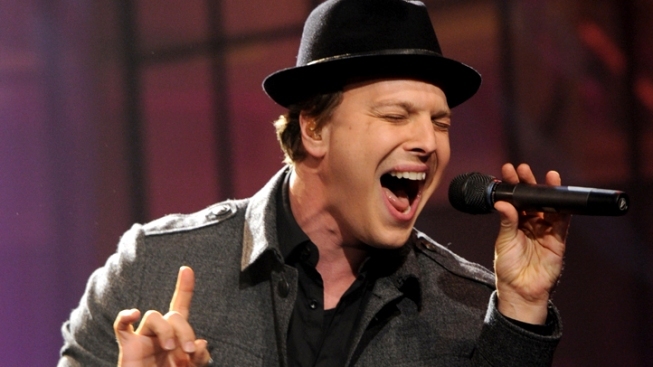 Gavin DeGraw is surprisingly thankful for many things that resulted following the horrific August 8 assault on the singer in New York City, an incident that left him hospitalized. "I had an encounter with a group of people in New York City. It didn't go well for me, but I lived. I lived and I have all my [faculties] and I mean, not to say that I didn't have fear, but I feel really good about the experience overall," Gavin told Access Hollywood on Friday. "It was a little nerve-wracking — the first time I touched my face I felt things were a little swollen, but I smiled when I felt my mouth and I realized I had all my teeth. "It's funny how the little things that you take for granted mean so much," he added. The 34-year-old singer was assaulted by a group of people in the early hours of August 8, and was later possibly hit by a taxi (Gavin told Access he does not if he was hit by or stumbled upon a taxi, after being bloodied in the attack) before being taken to New York's Bellevue Hospital. On Friday, Gavin told Access Hollywood he didn't realize how bad things were until he saw the reaction from his loved ones. "It didn't hit me until I saw the look on my parents' faces and my brother when they visited me at the hospital and that really kind of allowed me to see that it was bad," he said. "They were my mirror and that was heavy, but I will say that there was a lot of love that came out of it. Even though you may feel like there's a lack of humanity because it can happen to you, you experience much more humanity from the response you're getting from people." Looking at it optimistically, the singer, who is currently promoting his latest single, "Not Over You," off his upcoming album "Sweeter," which will be released on Tuesday, said some of the injuries he received happen to another kind of person on a weekly basis. "It happens, something happens to everybody and this happened to me, he said. "This is — it's nothing that doesn't happen to professional football players on the weekends… I had a concussion." While his memory of the incident is a little murky, Gavin said he's doing all right now. "I just don't remember much. I got dinged up and I lived through it and I'm happy I did," he said. PLAY IT NOW: Jermaine Jackson: Why Did Michael Jackson Pay The Family Off In The Alleged Child Molestation Case?